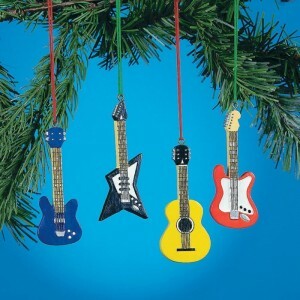 Thanks to everyone who came out to our Christmas at the Barony and New Year at Stramash gigs. 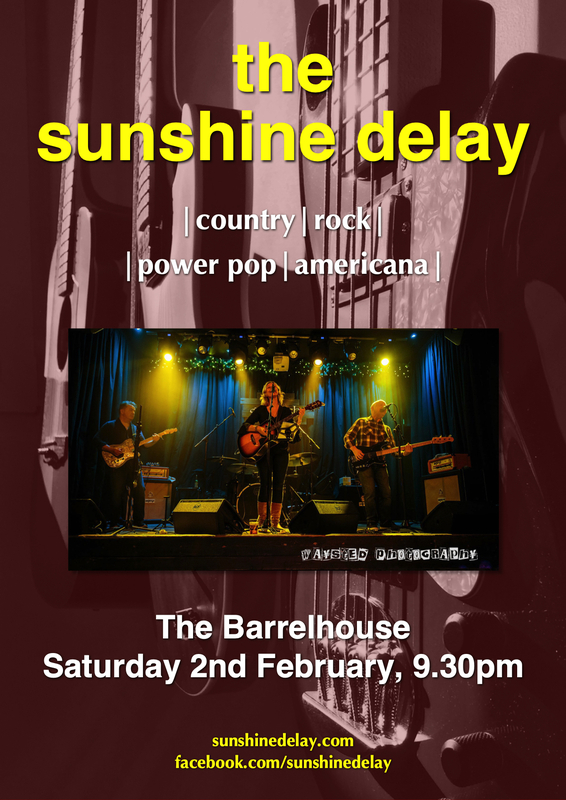 We’ve a couple of new Edinburgh venues already booked to play this year – the first being the award-winning Barrelhouse Bar & Grill at Jock’s Lodge/Smokey Brae on Saturday 2nd February 2019. 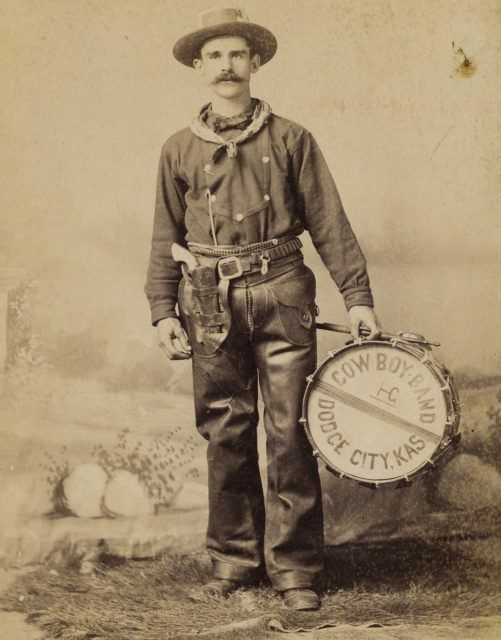 We’ll be playing two sets from 9.30pm, so plenty time for you to get there early and enjoy their tasty Cajun food and then some flaming hot Americana! Just four days until our Haddstock debut, where we’ll be orchestrating the rituals of rockin’ Americana in the Masonic Hall, Haddington, 4pm sharp on Saturday 16th June. It’s a family day out, with many great bands playing throughout this one-day festival. On Sunday 1st July, we’re back in the bonnie Barony Bar, 6-8pm, and then we’ll be storming in Stramash on Sunday 22nd July, 7-9pm. Enough to keep the sun shining! We’re very happy to be part of this year’s Haddstock Festival; a one-day event on 16th June in the bars and halls of genteel Haddington, involving 50 different musical acts. We’re on at 4pm in the Masonic Hall, but we’ll be taking in the sights and sounds of the day which is being held across 15 different venues. We’ve also got a couple of May gigs coming up: Sunday 13th, 6-8pm in the lovely Barony Bar, and then the following Sunday 20th, 7-9pm in storming Stramash. Folks, you’re spoilt for choice! We’ll be making our 2018 debut in our favourite Barony Bar on Sunday 25th March, 6-8pm, and then alt.countryfying the hell outta our Easter eggs at the lovely Stramash on Sunday 1st April, from 9.30pm. Sunday is obviously where it’s at – we hope you’ll be there too! Come on out and join us for (what’s becoming as annual an event as the big day itself…) our Christmas gig at the Village where we’ll fill up your stockings with songs and solos galore. And as much as any good country boy or girl could dream of! 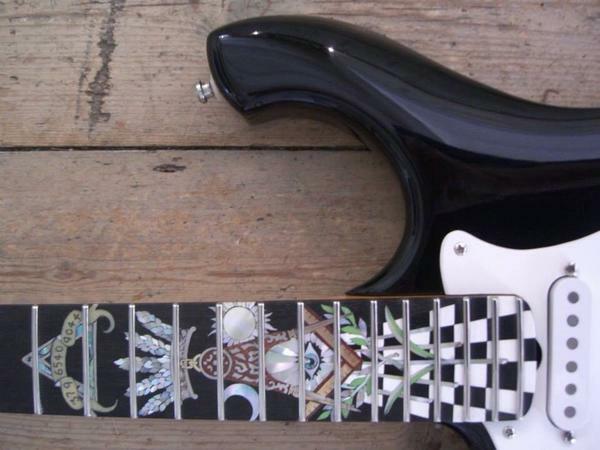 Doors – 7.30pm, music – 8.15pm, entry – by kind donation, if you wish. And now we’re looking forward to our trip up the A9 to bonnie Pitlochry at the end of this month. 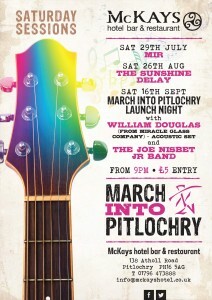 We’re playing the Saturday Sessions on 26th August, hosted by March into Pitlochry at McKays hotel. Music kicks off at 9pm and just a fiver on the door. See you there if you’re in the area. 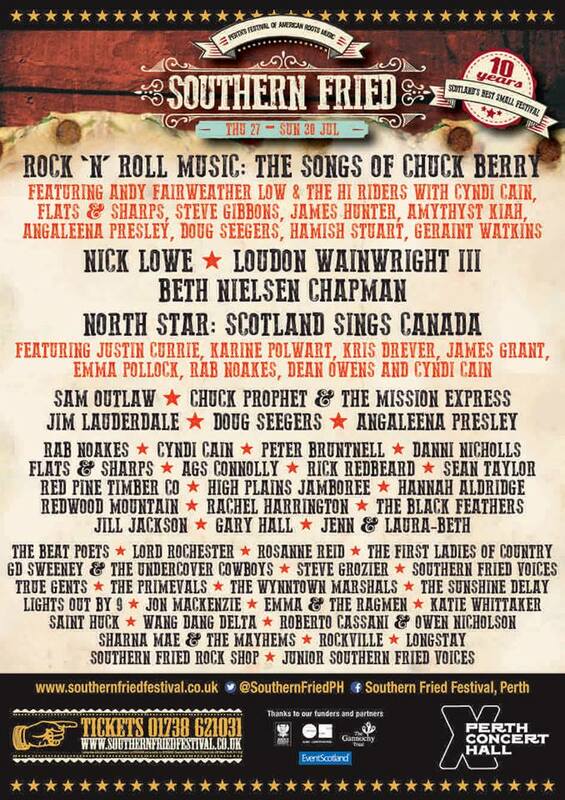 Southern Fried Festival, Outside Stage, Perth Concert Hall – Saturday 29th July, 3pm. Sunday Service, The Village, Edinburgh – Sunday 30th July, 4pm. 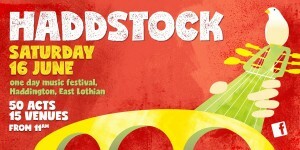 Foodies Festival, Inverleith Park, Edinburgh – Saturday 5th August, 3pm, and Sunday 6th August, 4.40pm. 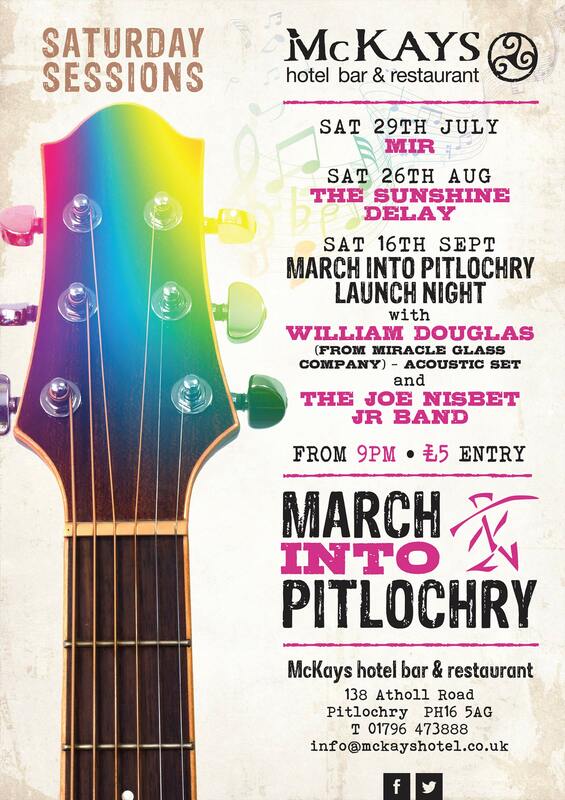 March into Pitlochry, Saturday Sessions, McKays Hotel, Pitlochry – Saturday 26th August, 9pm. Hope to see you looking hot somewhere! 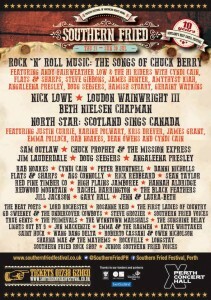 We’re very excited to be taking part in this year’s Southern Fried all-things-Americana-fest in sunny Perth. 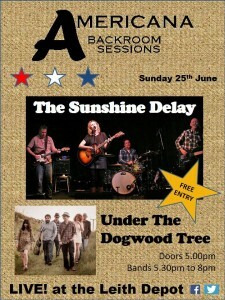 We’ll be playing the free Outdoor Stage at 3pm on Saturday 29th July. And we’re sharing a poster with Nick Lowe! See youse down the front. 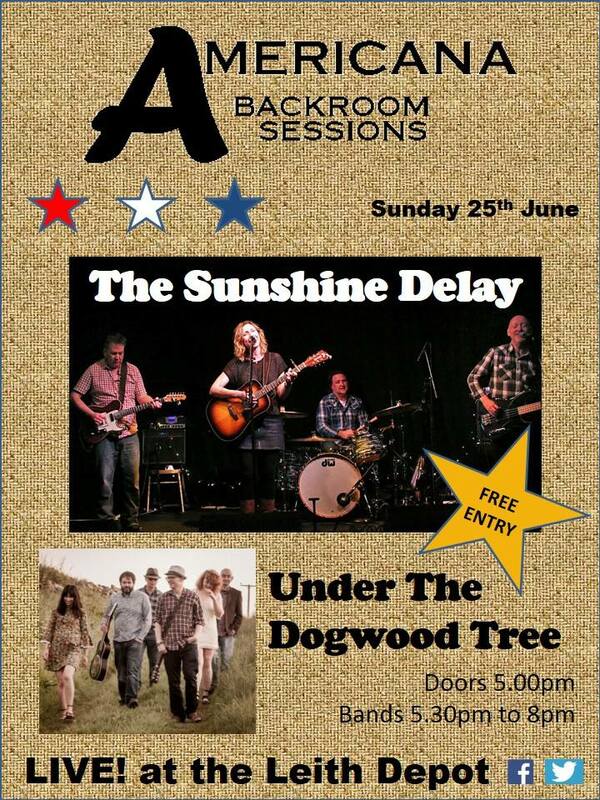 Looking forward to making our debut at the Leith Depot next Sunday, 25th June, playing as part of the Americana Backroom Sessions. We’re sharing the stage with fellow Americaners, Under The Dogwood Tree, who’ve also been working hard to get a lot of great bands playing this cool venue. 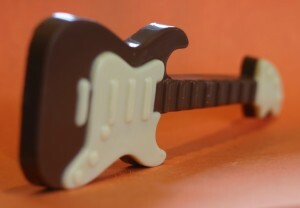 We’ll be treating you to a set of our own tunes, some new and some old. 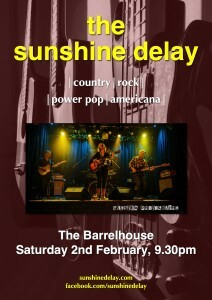 Doors 5pm, Dogwood Tree 5.30pm, The Sunshine Delay 7pm. Free gig, so see youse down the front! We had a great night there last month, and we’re very happy to be playing Bilbos on Chambers Street again this Friday 14th April, 9pm. The very talented Mike Foy (Dropkick, Basher, Spangles) will be sitting in for Brendan on drums.